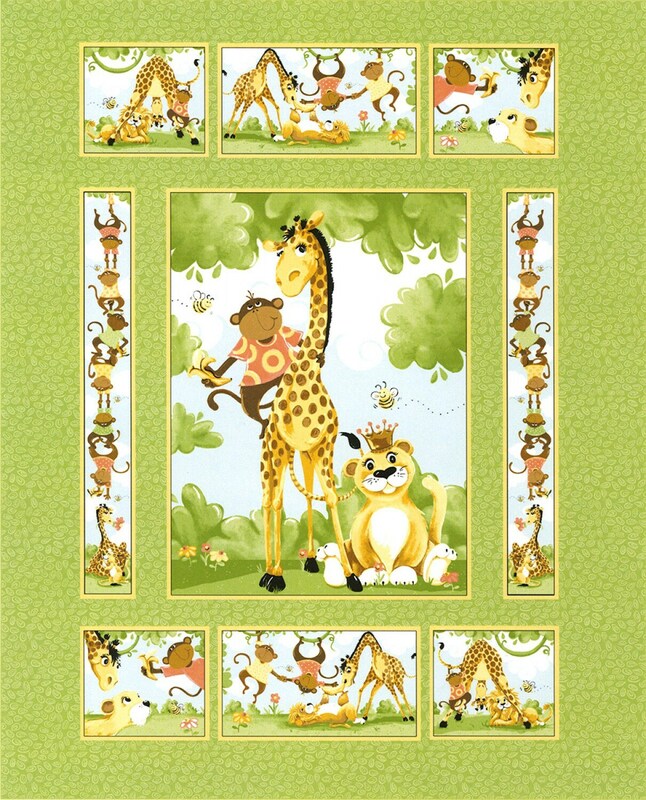 This fabric panel features the newly designed Zoe the Giraffe, Oolie Monkey and Lyon the Lion. The large image of Zoe and her friends is the center of the piece. For a fast and easy baby quilt, simply add batting and backing, quilt and bind! This fun panel joins our other fun Susybee Fabric Panels. This Fabric is 100% cotton, 44" wide. Sold as a 35" x 44" panel. Susy Bleasby has made her mark in the world by creating a whole world of silly and loveable characters, then painting them on the walls of hospitals. She connects with patients with her cast of funny friends who find ways to make us giggle even in the worst of times. Susy and her friends find the humor in life in those murals. Now she brings the World of Susybee to fabric. All fabric from The Quilted Nursery Children's Fabric Store is cut directly from the bolt in continuous yardage unless otherwise specified by our customers. We now offer fractional yardage cuts for your shopping convenience. All shipping overages are refunded on shipment of fabric. Same day shipping always except for Sunday and holidays. Happy sewing!